Learn how to cut foam with your Silhouette Cameo to create cute pencil toppers, craft projects, and more! 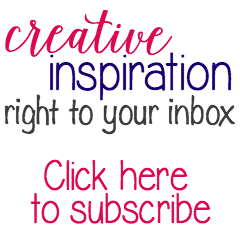 Fabric, vinyl, card stock, sticker paper, chipboard – your Silhouette Cameo can cut a lot of different materials! The one question I see quite often is, “Can my Silhouette Cameo cut foam?” Why yes, yes it can. 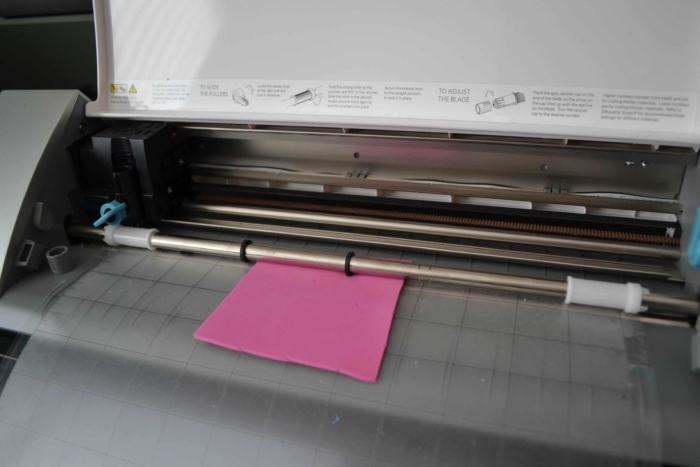 And I’ll even let you in on a few little secrets to help you make your first foam cut. Through some trial and error, I was able to figure out the best settings and techniques for cutting foam. 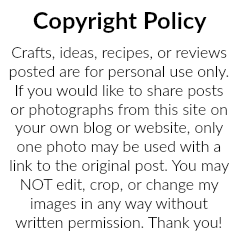 For the best results, you will want to use a piece of foam that is about an inch larger than the shape you are going to be cutting and place the foam in the middle of your mat. I was a bit nervous making the first cut, as foam is not one of the medias recommended by Silhouette to cut with the Cameo. But being a crafting rebel, I put the foam on my mat, changed some settings, closed my eyes, and pushed the cut button. One thing I expected after pulling the foam off my cutting mat was that the shape would be easy to remove, similar to when you cut paper shapes. This was not the case. If you look at the back of the foam, you cannot see the cut marks – at all. And after cutting it again and again, it still looked like that. I was ready to throw in the towel when I realized if you use scissors to cut a little into the edge of the foam, you can separate your shape from the rest of the foam. 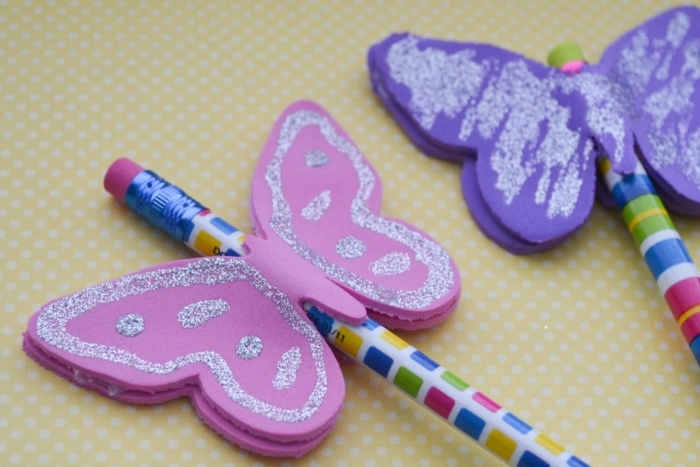 I thought these foam butterflies would make for some cute pencil toppers! 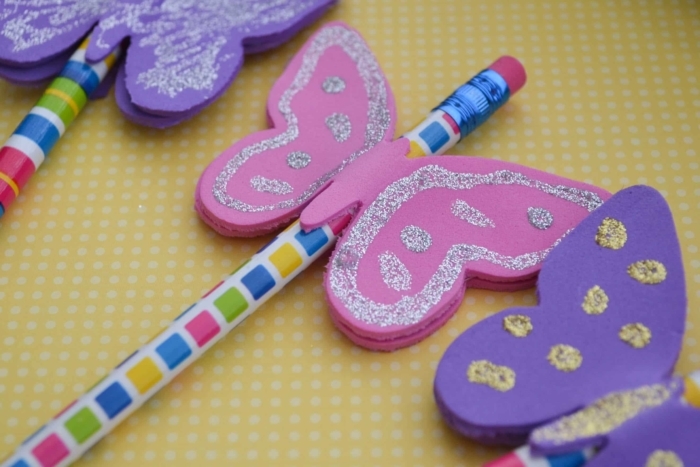 After cutting out two butterflies for each pencil, I used some glitter glue to decorate them. 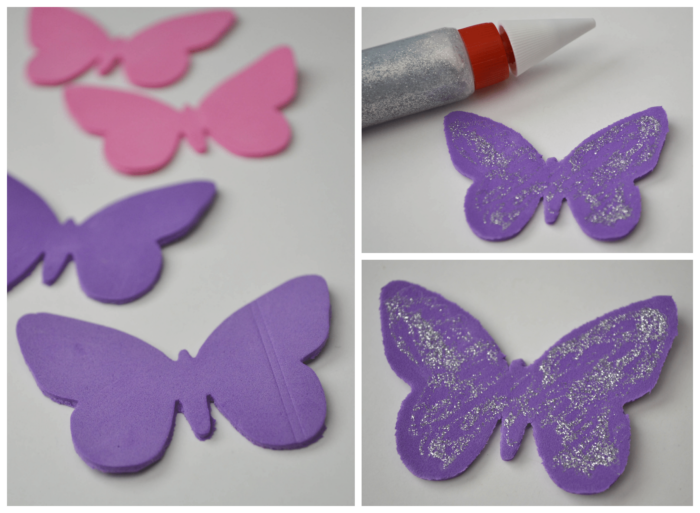 After the glitter glue is dry, I put one butterfly face down on the table and covered it in hot glue. You’ll have to work quickly to then put the pencil and other butterfly on top before the hot glue hardens. 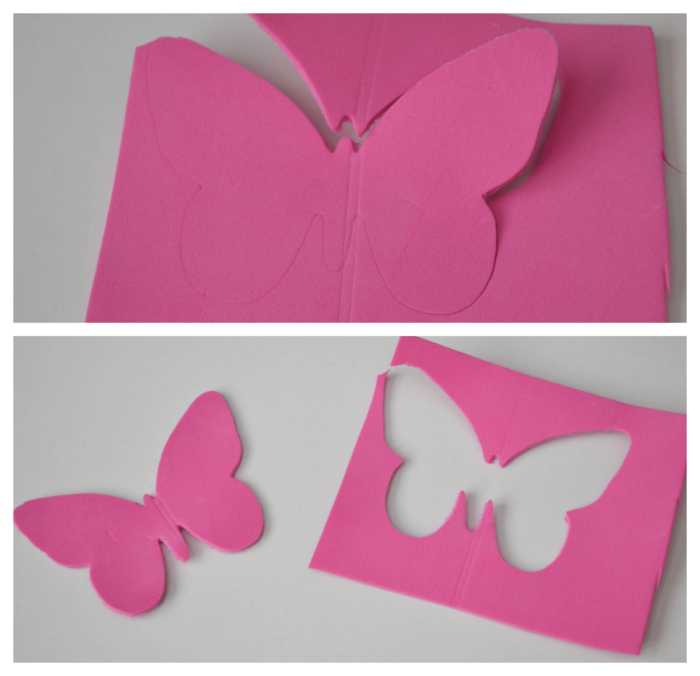 There you have it – some super cute foam butterfly pencil toppers to help you flutter into spring! And how fun would these be to make at a classroom party or to give as a birthday party favor! 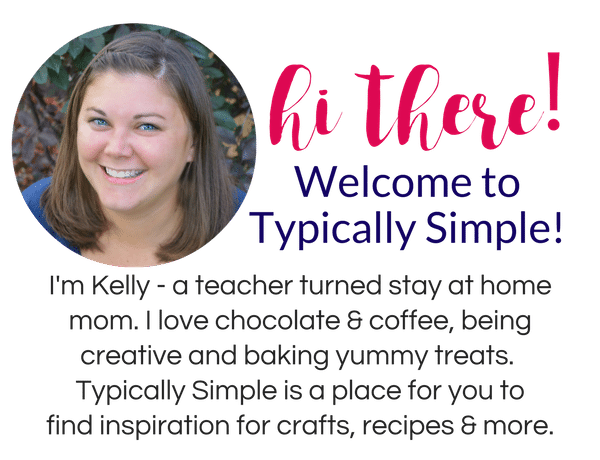 Be sure to check out these other Silhouette Cameo projects!